I know, we photographers are a rugged, fearless lot, but let’s talk a little about safety while photographing in Oregon. If you are an amateur photographer and new to Oregon I hope you will read this carefully. If you are an old hand at photography you might be inclined to passes safety tips up. PLEASE DON’T. If nothing else, review the stuff about bears and cougars. You’re going to get poison oak sooner or later anyway. Oregon, with all it’s charms, has it’s own set of dangers that you might not be as familiar with as your local areas. For instance, I, in larger cities have a bad habit of randomly taking off into areas that “Look cool” but no locals would consider braving their way in…even if they saw a pile of bags made of $100 bills, on fire, pouring out fluffy white kittens wearing diamond collars. I’ve had a few close calls and been severely chastised by friends who avoid those areas like the plague. One lovely day, on my way home from assisting at a youth camp in the mountains, I called home before I left, while I still had phone service, and let my people know I was on my way over the pass. On the way I decided it might be a great idea to take a five-mile detour to a popular waterfall (Sahalie Falls), at the height of spring when the water was flowing the heaviest. I still had cell phone service when I thought of it, but was too excited at the prospects to make the call home. I had no phone service when I got to the waterfalls. I was right; the water over the falls was fantastic, ROARING, in fact the most water I had ever seen there! AWESOME! I figured further down the trail at the middle falls, the water would be fantastic too… Forgetting all about any kind of safety, I headed down the trail, all alone, no other people around. There, on a nice little grassy mound off the trail looked to be the perfect vantage point to hang out over the river to get a shot up the river of the partially hidden middle falls, so I went off the trail and out on the grassy mound, with no one around. The nice grassy mound hanging over the river, the slippery one covered in river spray. I set up my tripod and turned to check something. My foot slipped and I sat down on the wet mound of grass, which just as easily could have been, “I FELL INTO THE RAGING RIVER (WITH MY CAMERA)”. Truly, I shook all the way up the trail. I suppose the only good thing about the part of no one around, was that there were no witnesses to my stupidity. I try to remember to at least give people a clue as to where to start dragging the river or look for full-bellied bears should I not come home. So #1 safety tip here: Let someone know where you are going! …and that example didn’t even involve cougars, bears or snakes. Okay, on to some basics for Oregon. You might assume your top safety device is your phone. Many of the best areas for photography in Oregon have no phone service. Tell someone where you are planning to go and try to update them if you decide to divert. Bad idea! I should repeat that….. Bad idea! Really! BIGGEST SAFETY MISTAKE. But, if you must (you know who you are and I’m lookin’ in the mirror), get yourself some really good landmarks, like a lake or a big RV, keeping in mind that mushrooms, fields of flowers and pine trees eventually all look alike. Never, ever, pay attention to a friend who says, “This looks like a short cut.” even if it’s ME (which it wasn’t that time). 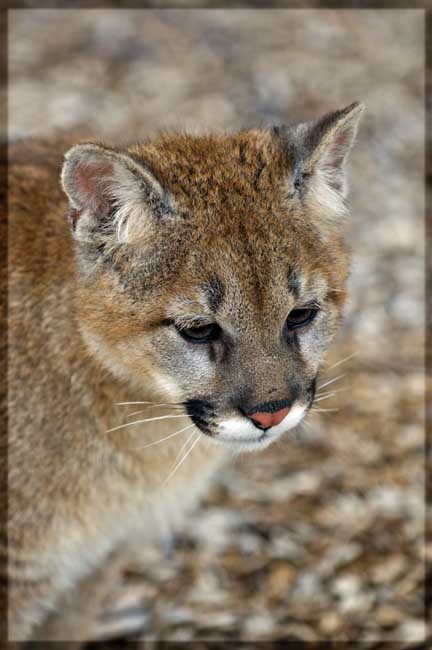 Usually if a cougar, Bobcat or bear has been sited in the area, there will be a safety notice at the trailhead. If they have not been spotted then …SURPRISE! 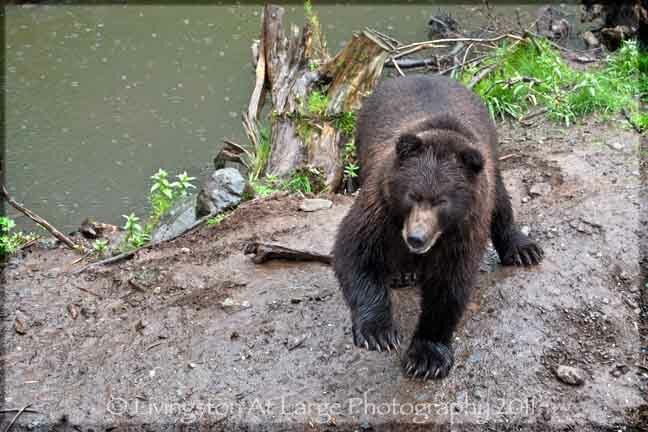 Yes, there are bears in Oregon. They like blackberries and tourists. Bears look cute, especially if you find a baby bear. BEARS WILL EAT YOU. Mommy bears will enjoy it. #1 safety tip: If you're camping, lock your food in your car. Don't keep it in your tent. My friends had to cut their way out the back of their tent last year to escape. Do not make fast or startling movements. Do not run. Most bears can outrun you. Do not play dead. Black bears eat dead things. You first. Do not climb a tree. Bears are better and faster at it. Do not make eye contact and/or smile showing teeth, they are aggressive signals to bears. (I’m pretty sure smiling will not be on your list). Back away slowly being sure to leave the bear a clear escape route. If you have any voice, speak to the bear in a calm assertive voice. If there is any indication you are annoying the bear stop moving/talking. If you plan on spending a lot of time in the forest during bear seasons get some bear mace. Report the sighting to someone (Fish and Game or a Ranger or a local). Again. Yes, there are cougars in Oregon. Sometimes on your front porch. #1 safety tip: DO NOT LEAVE CAT FOOD OUTSIDE. You will attract the wrong kind of cats. Do not play dead. It won’t be playing for long. Do not turn and run. Cougars and Bobcats can out run you. Back away slowly while keeping eye contact. Puff up, raise your arms and try to look as large as you can. Pick up your smaller child. They are more attractive prey. Most of the snakes you will find out in the wild are not poisonous, but, of course, some are and unless you are really familiar with them, assume it is a poisonous snake but don’t panic. Other than wild horses, snakes are the creatures I have run into the most while taking photos in Oregon, especially in the mines. Do not panic. Snakes just want to get away from you and they do not like to be surprised. Do not try to touch it. Do not poke it with your tripod. Do not try to take macro shots of it. (Back up and use a long lens). Take some preventative measures beforehand, like wearing boots and jeans and not going off trail. If you’re going into something, like one of the mine buildings, take a stick, or your tripod and bang it around a little before entry. Give them fair warning. Watch where you’re walking, especially near or on rock and woodpiles. A nice sunny day will find snakes sunbathing on rocks. Leave a clear path of escape. Stand still or walk in the opposite direction. 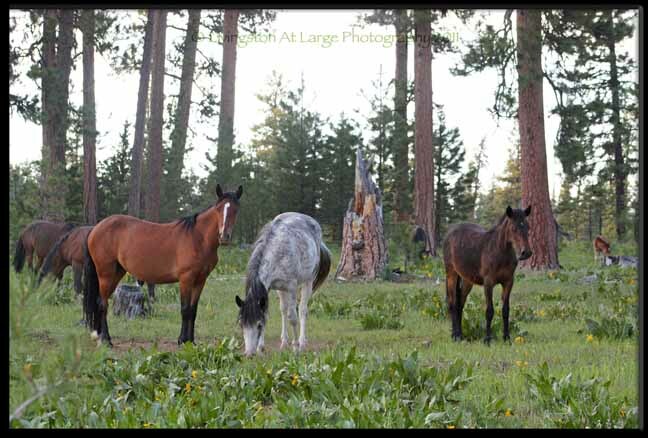 It is very exciting when you come across a herd of Oregon’s native wild horses. 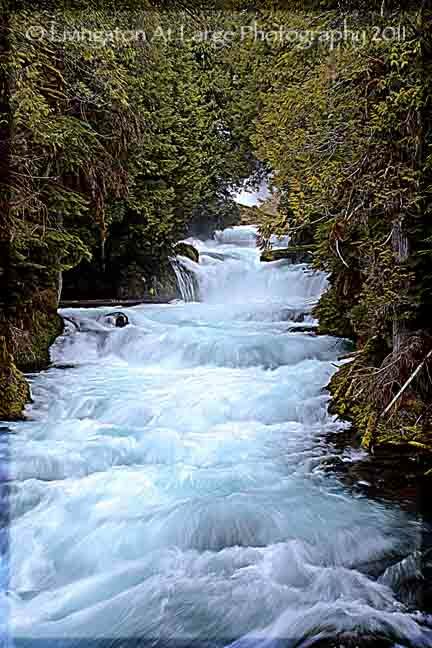 They are abundant, especially in Ochoco National Forest near Prineville, Oregon and the Warm Springs Indian Reservation outside of Madras Oregon. They are magical and lovely and for the most part, harmless. There is however a daddy horse protector for each herd, the “Stud Horse”. His job is to protect his women and children and if pressured can be very dangerous. 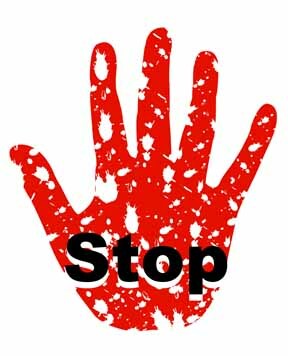 #1 safety tip: Do not make fast or aggressive movements. Do not attempt to touch or catch them. Do not be aggressive with a vehicle if they are blocking the road. Do not harass them in ways that would be deemed illegal. (Use common sense). The wild horses are protected by law. Watch closely for them as they are free range and can be out on the highway. If you see loose horses in the forest, or on the side of the road…SLOW DOWN. We have come around corners on highways and found the whole herd in the road. If you want to photograph them, find a safe place to pull over. Make eye contact with the horses. The stud will gather the herd to what he feels is a safe distance and they will usually tuck the babies away. After they are done doing that, I approach at a safe distance. You’ll know you are too close if they pop their heads up and start to move away. Stop moving if you want to keep them in your photography sights. If you see that a wild horse is sick or injured, please report it to local authorities. There are people/rescues who will take them in and care for them until they are well enough to be returned to their herd. They’re cute, they’re controversial and they’re EVERYWHERE. 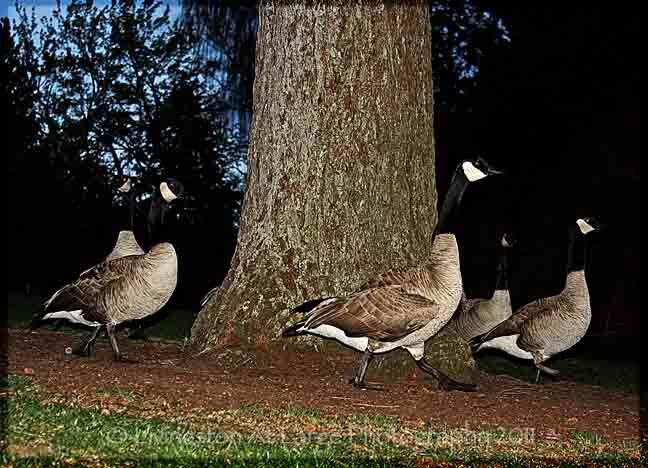 #1 safety tip: Canadian Geese if pressed are GEESE. They will come beat the ever-living snot out of you with their very effective wings while biting you REALLY HARD. Do not get that close to them, even if they beg you for food. Do not feed them. That causes them to congregate in places they are not wanted and then the powers-that-be euthanize them and feed them to the homeless….don’t get me started. “Leaves of three, let them be.” Good info, but there are a LOT of plants with “leaves of three”. Poison ivy/oak looks like this. PoisonIvy.org get a little familiar with that plant. It will save you a ton of grief and money in pink lotions. #1 safety tip: Know what it looks like! Are poison oak and poison ivy the same thing? Poison ivy, poison oak, and poison sumac are Anacardiaceae, members of the cashew family. (Surprised? Me too. )Poison ivy falls into the classification of Rhus radicans or Toxicondendron radicans. Poison oak is of the Rhus diversiloba or Toxicondendron diversilobum. So, not exactly but close enough.Since the oil from any of the above plants can be transferred from clothing, shoes and pets, it is a very good idea to take everything off and wash it, as well as yourself, if you have been in an area that you’ve seen poison ivy/oak in. In the spring and fall Oregon abounds with wild mushrooms. Many are edible, a few are lethal and many belong to the “Lose your lunch bunch.” They won’t kill you, but you will wish for a bit that they did. This one pictured is of the really bad (fatal) ones. #1 safety tip: There are many good resources out there, but the best one is, if you are not 100% sure (and I MEAN 100%) do NOT eat it. Also, if you pick them, you need a permit. 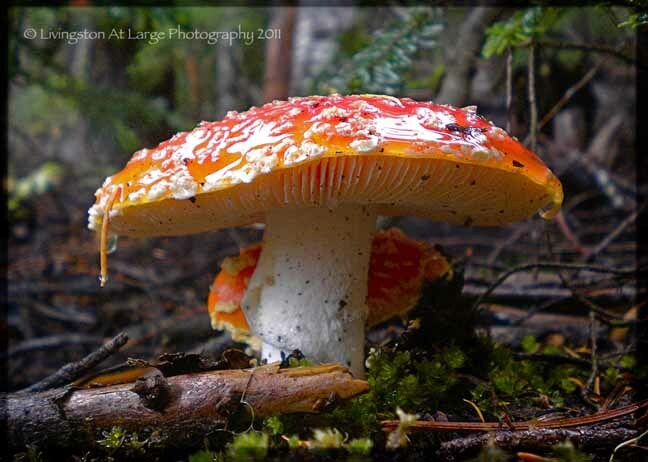 This is covered more on the Oregon Wild Mushroom Photography Page. The weather in Oregon changes rapidly. It’s a good idea, even if it is 80 degrees and sunny when you leave for the forest, to have some kind of foul weather gear with you. #1 safety tip: SLOW DOWN. It takes such a small amount of ice to lose control if you are going fast. If it is snowing, make sure you have traction tires and/or chains, water, flares, and some kind of dry food source (granola bars and the like) should you slide off the highway. All winter long I carry the above listed and a sleeping bag in my car.